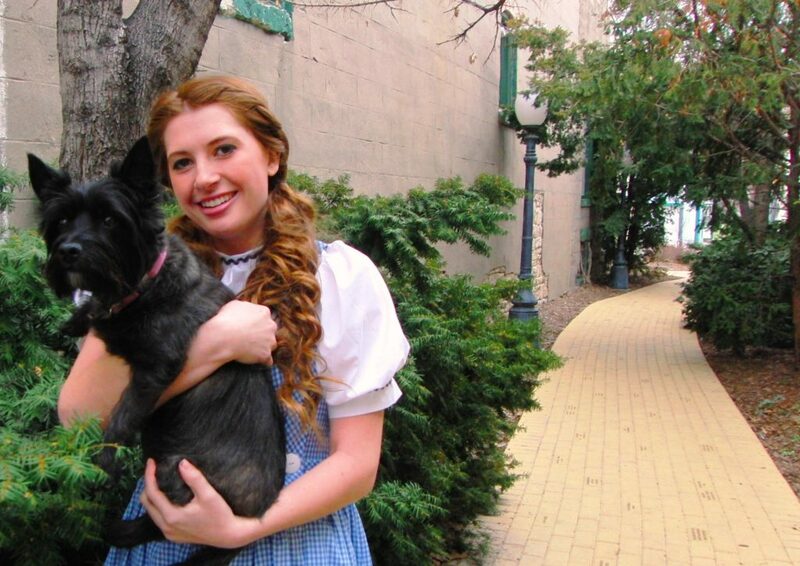 Dorothy and Toto pause on their way down the Yellow Brick Road in downtown Wamego. 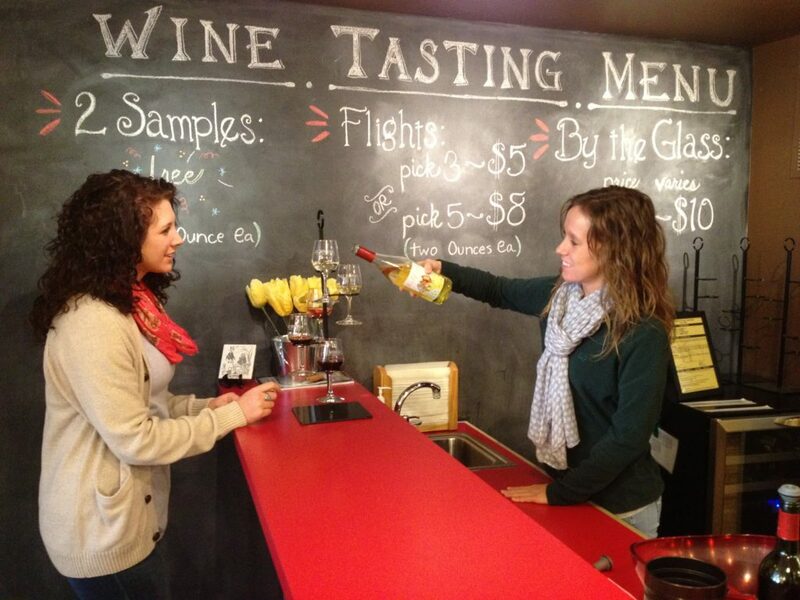 A customer at Oz Winery enjoys wine flights from their vast selection. 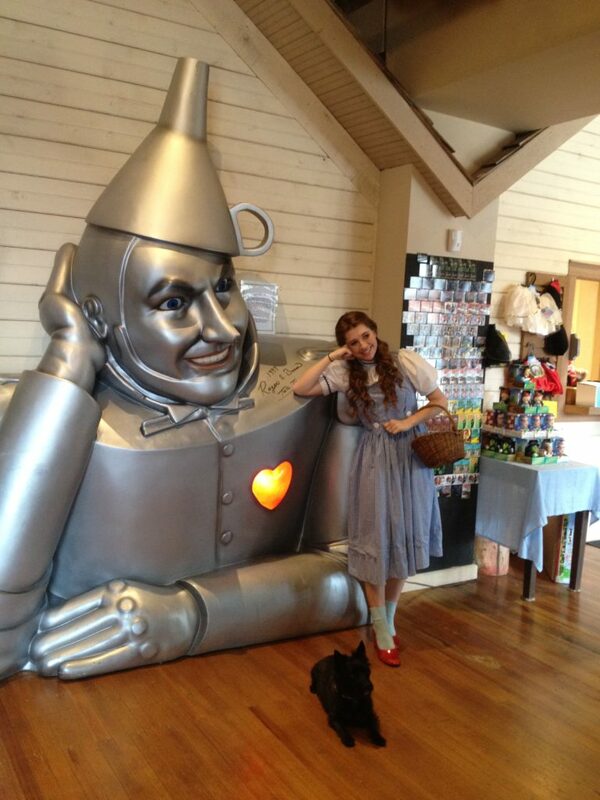 Dorothy and Toto pose near a large bust of the Tin Man at the Oz Museum. 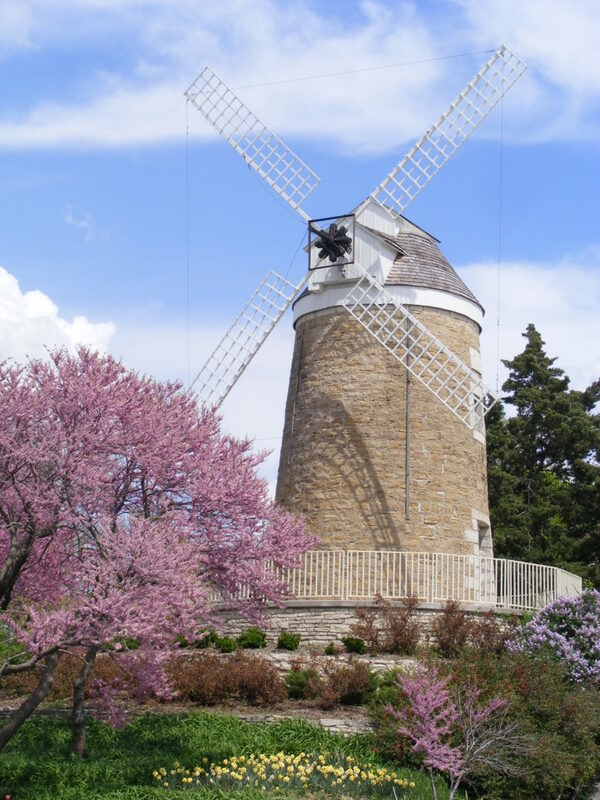 Wamego City Park showcases a Dutch windmill, once used as a mill to grind grain into flour. According to the Library of Congress, “The Wizard of Oz” (1939) is the most-watched film ever, and the American Film Institute rates it the No. 1 fantasy film of all time. L. Frank Baum’s books have been translated into well over 50 languages. The story’s high-ranking place in popular culture worldwide is ensured by its timeless appeal to kids and grown-ups alike. Who doesn’t want to go “somewhere over the Rainbow” when times get tough? Just a little over an hour’s drive from Lawrence, the Land of Oz beckons. The Oz Museum in Wamego offers the largest private collection of Wizard of Oz memorabilia in the nation. Auntie Em’s Gift shop (strategically placed at the beginning and end of the Museum tour) is sepia-toned, like the black-and-white scenes set in Kansas in the movie. But once you pass through the screen door of Dorothy’s farmhouse into the Museum itself, your experience changes to Technicolor. The Oz Museum encompasses everything Oz-related imaginable, from the earliest Baum books to today’s “Hello Kitty” plush, Oz-themed collectible dolls. Journey through rooms filled with over 2,000 artifacts and movie set displays containing life-sized wax characters in various full-scale scene replicas from the film. Original movie props include two flying monkey casts and the official Death Certificate for the Wicked Witch of the East. You can also watch the 1939 movie itself inside a little theater. You’ll learn a lot from reading the placards. For example, Baum was home-schooled until the age of 12, giving him plenty of time for dreaming. He married the daughter of a prominent suffragist and feminist, which may explain why so many of his books’ strong characters (both good and evil) are female. From the hot air balloon hanging from the ceiling to the handprints of Munchkin cast members, this museum is bound to dazzle devoted Oz fans. Kiddos will especially enjoy the interactive “tornado machine” and the penny press in the lobby. Before the advent of Prohibition, Kansas was the third-largest grape-producing state in the nation, according to head Winemaker and Co-owner (with Brooke Balderson) of Oz Winery, Noah Wright. Wright hand crafts red, white and blush wines with such clever names as Bust My Buttons (an earthy and floral Traminette), mostly from grapes cultivated under the Kansas sun. The winery bottles about 5,000 gallons of wine per year. I sampled Surrender (sherry-style dessert wine with notes of caramel, toffee and butterscotch), Auntie Em’s Prairie Rose (white zinfandel), Wine of a Different Color (semi-sweet Catawba), Yellow Brick Road (chardonnay and vignoles blend), and their best-seller, Squished Witch (fruity, semi-sweet ives noir-based red). In homage to the canine star, Craig and Colleen Lord opened Toto’s Tacoz on Wamego’s main street, just steps from the Oz Museum. Colleen is an artist who designed the eatery’s murals, and incorporated about 64 different Totos in her paintings for kids to find while they’re waiting for their meals. Craig is “the Wiz” who cheerfully takes customized orders. Both of them cite Wamego’s “unique magic” as the reason they moved there from California. Portion sizes are ginormous — just try to get your mouth around the huge tacos without using a fork! There’s even a 12″ Bust My Buttons burrito to try when you’re sporting an elastic waistband. The Yellow Brick Road across from the Oz Museum downtown leads you to the Friendship House Dutch Mill Bakery & Restaurant, which serves delicious home-cooked breakfasts and lunches (and special brunch meals on Sundays, featuring comfort foods like beef brisket and mashed potatoes), as well as nine varieties of delicious cookies, including “the Fudgie.” Owner Mike Pray stresses “quality over quantity.” Try the blueberry pie and you’ll be smacking your lips all day. Apart from the Oz-themed attractions, Wamego oozes small-town charm. You might think that you’ve landed in Mayberry RFD. Walk through the doors of the Columbian Theatre (1896), and you’ll experience the atmosphere of an era long since vanished. Wamego City Park showcases the Schonhoff Windmill (built by a Dutch immigrant), and a mini-Prairie-town with restored buildings and a children’s train. Don’t blink when you drive past the house on the southeast corner of Lincoln Ave. and U.S. 24 on your way back home, and you might see the Wicked Witch of the East’s legs poking out from the bottom of it. It looks as if she must have been on a burger run to the McDonald’s next-door when the house fell on her. More proof that fast food is hazardous to your health.